Finish: Shape F Ball Nose Tree Cutting: Cross Toothing / Aluminium Toothing Toothing: CT4 / Alumin.. Finish: Shape M Cone Cutting: Cross Toothing Toothing: CT4 Surface: Bright / Titanium Carbon Nit.. Finish: Shape C Oval Cutting: Cross Toothing / Aluminium Toothing Toothing: CT4 / Aluminium Surfa.. Finish: Shape G Tree Cutting: Cross Toothing / Aluminium Toothing Toothing: CT4 / Aluminium Surfa.. 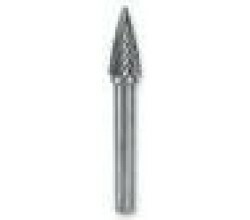 Finish: Shape A Cylinder with end Toothing Cutting: Cross Toothing / Aluminium Toothing Toothing: .. Finish: Shape A Cylinder without end Toothing Cutting: Cross Toothing Toothing: CT4 Surface: Brig.. Finish: Shape D Ball Type Cutting: Cross Toothing / Aluminium Toothing Toothing: CT4 / Aluminium ..
Rotary burr for aluminium Finish: Shape C Oval Cutting: Cross Toothing / Aluminium Toothing Tooth..
Set includes: 2 x shape A, cylinder (ZYA) without end toothing 10mm & 12mm 2 x shape C, oval (WR..
1 x 6mm & 1 x 12mm in mini box of the following Shape A, cylinder with end toothing Shape C, ova..